For thousands of years, House Umber has been staunch allies of House Stark. With both Houses located in the far north of Westeros, close to the Wall, they often have to defend against wilding encounters. This has forged a strong bond of friendship and loyalty between the two. Now, during the War of the Five Kings, House Umber has answered the call of Stark and marches to war under the banner of the Dire Wolf. A hardy people, they make strong soldiers on the battlefield and will hopefully ensure that a Stark is on the Iron Throne. 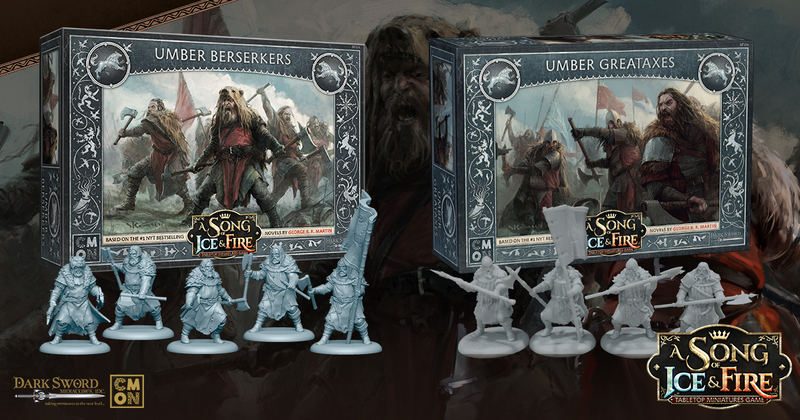 This month, two new House Umber unit boxes will be released. They work exclusively for Stark commanders. Let’s take a look at them now. If there’s one thing that House Stark is good at, it’s making loyal allies. House Umber is just one such house. With bonds of friendship and brotherhood going back thousands of years, these two houses have stood together on uncountable battlefields together. In the War of the Five Kings, they will certainly stand together on more. These new units will be a welcome sight for any Stark Commander. They will be available on October 26.